I’ll have to admit, bread is one of those things that I’m really terrified to make… hours and hours of kneading, rising, resting, with the possiblity of everything going completely awry… So I was determined to do everything for these classic sourdough loaves by the book (quite a committment for a busy girl). I used the recipe in the King Arthur Flour 200th Anniversary Cookbook. 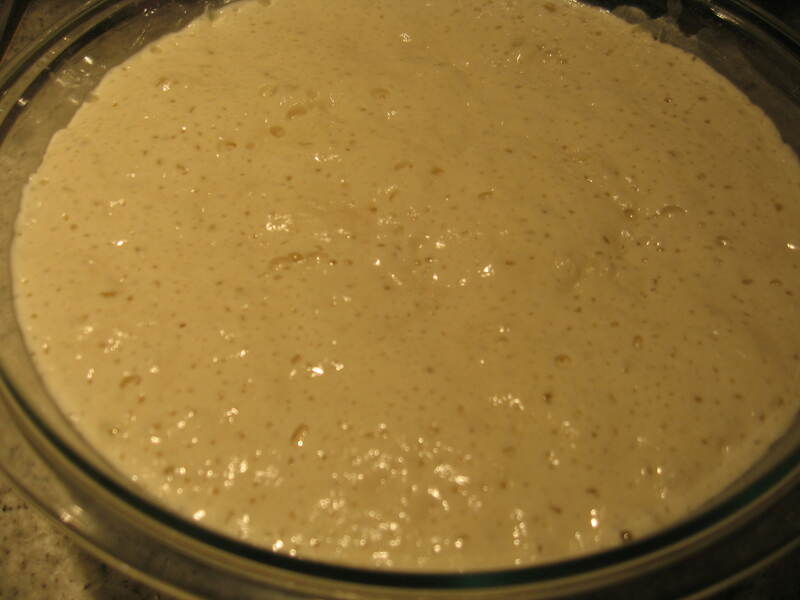 1 cup (9 ounces) “fed” sourdough starter — I love sourdough starter, it is like having a little friend in your fridge! Mix everything together, cover with plastic wrap, and let it rest for at least two hours (and up to 24). I let mine rest for exactly 12 hours and it tripled in size. When you are satisfied with your sponge, add 2-3 more cups of flour, 1 tablespoon of salt, and one tablespoon of sugar. Mix until the dough comes together, and then knead until it is smooth and elastic. 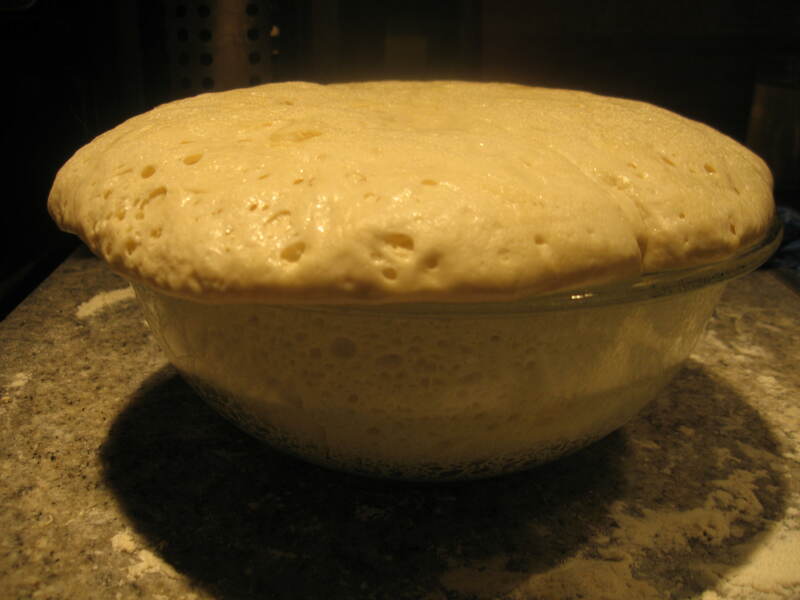 Place the ball of dough in an oiled bowl, cover with plastic wrap, and allow to rise for 2-4 hours. I let mine for exactly three hours (now 11PM, exhausted). After it has finished rising, punch the dough down (it should have bubbled up quite a bit), form into two loaves, put them on a large baking sheet and let them rise for another 2-4 hours. I let mine rise for 3 (now 2AM, can hardly keep my eyes open, but determined to do everything correctly). Preheat your oven to 450 degrees and place a baking pan at the very bottom of the oven. Pour about 2-3 cups of boiling water in (this will allow the bread to steam a bit). 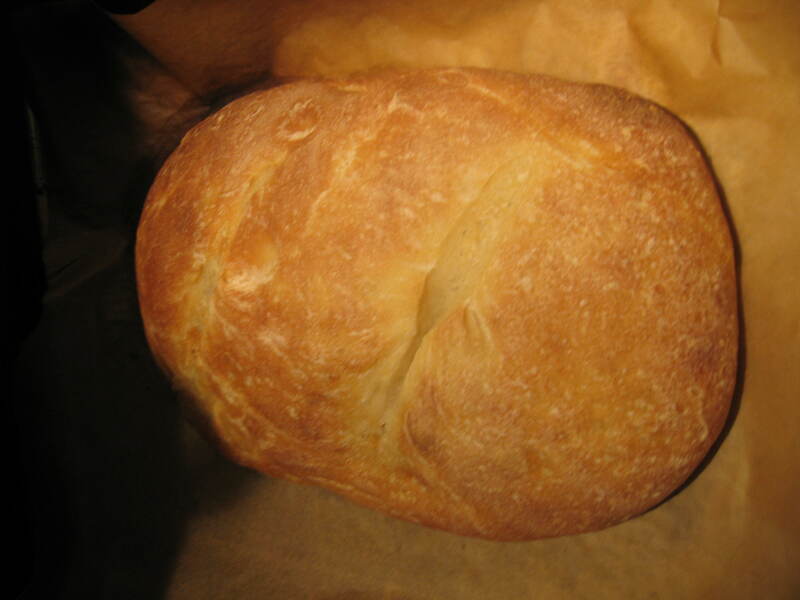 Brush or spray some water over the loaves, and slash them a couple of times across the top with a bread knife. Then pop them in the oven for about 25 minutes (now about 2:45AM, hallucinating). Cool the loaves completely, slice, and enjoy! 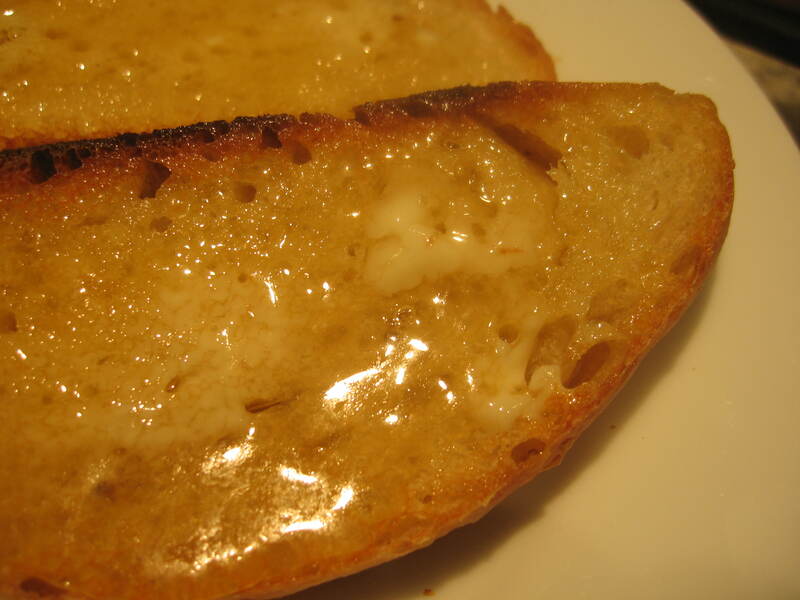 And what better (in my opinion) way to enjoy sourdough bread than toasted with lots of butter and honey. Absolute heaven! And a very nice reward for my dedication and insomnia. This entry was posted in Sourdough and tagged bread, butter, honey, King Arthur Flour, sourdough. Bookmark the permalink. YUM! Great job — especially the waiting part! And your loaf is beautiful!